Click here for 2019 Program! 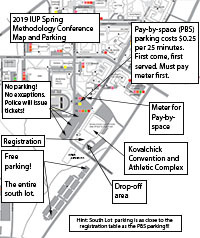 Click here or on the image for the parking map. This year, lodging can be found at the Hilton Garden Inn. We have a block of rooms reserved at a rate of $119 plus tax per room. Please click here to access the rate. You may also call 1-800-Hiltons and use the code SMC19 or call the property directly at 724-349-2222, ext. 0 and use the code SMC19. The rooms will release out of the block on March 12th.